Let me just start off by saying that when it was first announced over two and a half years ago that Matilda was coming to Broadway I was not that excited. To me it sounded like Billy Elliot all over again. Another over hyped show from London featuring a cast of kids. Now don't get me wrong. I actually enjoyed Billy Elliot. Although it took me nearly three years into it's run before I finally saw it. So why did I wait so long before seeing it? Once again. Too much hype. Therefore when we were invited to see Matilda I went in begrudgingly to say the least. Not only that but I had just worked all day and the last thing I wanted to do was spend my Saturday night in a crowded theatre with a bunch of kids. So there I sat in the Balcony of the Shubert Theatre waiting for the show to start. Fifteen minutes into the show and believe it or not but I was hooked. That little girl won me over. In fact the whole show eventually won me over as well. I guess it's true what they say. "Never judge a book by it's cover." I won't soon make that mistake again. Now I have heard from a few people that they had a hard time understanding the show at the beginning. It is very English so even I'll admit I had a little trouble at first understanding what they were saying. However eventually that subsided and I fell in love with the show. Yes I said it. I loved the show. Trust me. I was surprised as you are. Now while most people think that Matilda is essentially a children's show it is actually a great show for all ages. How many shows can you say that about today? Now just in case I still haven't convinced you to see it here is a little synopsis about the show. Enjoy! 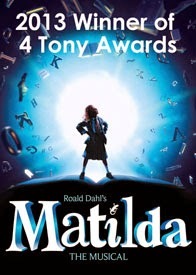 Based on the 1988 children's novel by best-selling author Roald Dahl, Matilda: The Musical charts the journey of the young, gifted Matilda Wormwood. Matilda is an extraordinary girl with a vivid imagination and a sharp mind whose talents are constantly belittled by her cruel parents and headmistress. Dreaming of a better life for herself, she dares to take a stand against these oppressive forces and takes her destiny into her own hands. By the way for those of you who still haven't seen it I have just one thing to say. What are you waiting for people? Matilda is a great show that you need to see. So how do you get tickets you ask? Well it's easy. Just give us a call and one of our friendly ticket experts at Applause will help you. Not only that but from now thru July 5 you can get tickets to see Matilda at prices that can't be beat. Get your Matilda tickets today. You won't regret it. Until next time theatre fans.